Generation of iPSCs harboring NKT cell–specific rearranged T cell receptor loci. (A) Colony shape and the expression of stage-specific embryo antigen 1 (SSEA1), Octamer-binding protein 3/4 (Oct3/4), and Nanog in the iPSC-7a and iPSC-7g cells. ESCs are shown as a reference. Scale bars: 100 μm (phase); 10 μm (immunofluorescence). (B) Expression of ESC marker genes in iPSC-7a and iPSC-7g cells. Results for RT-PCR analyses are shown. NKT-ES C-1 and NKT-ES D-1 were used as positive controls, and NKT-MEF was used as a negative control. 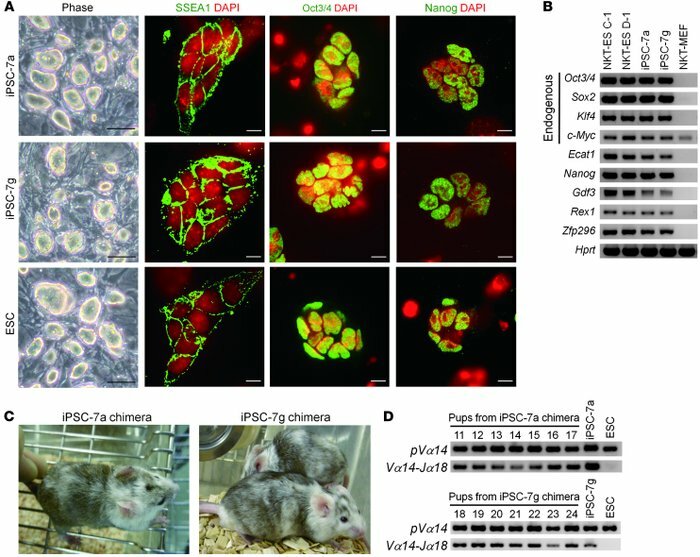 (C) External views of chimeras generated by injecting iPSC-7a and iPSC-7g cells into BALB/c blastocysts. (D) Transmission of the rearranged Tcra chain locus to the offspring of chimeras, which is characteristic of iPSC-7a (upper panel) and iPSC-7g cells (lower panel).